4.8/5 out of 593 votes. This semi-opaque blue-green variety of feldspar stone is named Amazonite stone after the Amazon River. Amazonite balances feminine and masculine energy. It promotes kindness and practicality. 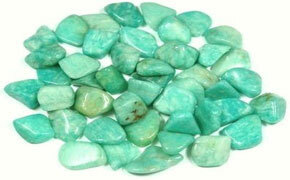 Amazonite is an excellent stone for artists and for men. Pale azure blue amazonite is know as the lucky "Hope Stone". Amazonite will be lucky for all your hopes and dreams. Amazonite is blue-green to pale green stone in the feldspar group. It is found in the United States, Australia, Brazil, Madagascar and Russia's Ilmen Mountains.